We depend completely on being connected when we are on the road and on the water. Because we run a virtual company which is an internet business, we can (and do) enjoy traveling extensively – even while working full time. While our blog posts focus on the adventure side of our travels, what you don’t see are the long days sitting at our laptops, running a complex company remotely from the road. Without reliable, high-performance internet, there would be no adventures. Our blog posts would be “Woke up at home this morning, made coffee, went for a hike, worked all day in the office, had dinner, watched TV, went to bed.” That’s not what we want to do (or write) and we’re pretty sure it’s not what you want to read, either. For years, we’ve struggled with the technology to keep us connected and working while we travel in the Airstream. We’ve tried just about every option available, and we’ve had friends and traveling companions who have tried just as many. We have learned a lot from their experience, as well as from our own. Since I’m an electronic engineer, a journalist and an analyst covering electronics technology, I figure I’m more qualified than the average Joe to locate the best way for us to stay online during our adventures. However, it’s been an ongoing challenge – even for me. We have tried everything from the obvious to the exotic – (and we have written about our experiences before)… Campground (and marina) WiFi is notoriously unreliable and slow, and it is a rare occasion indeed when we get a stable, fast connection that will allow us to work productively using the WiFi at a campground, RV park, or marina. Of course, we have tried USB modems, and portable 3G/4G/LTE devices such as Mi-Fi. Those are by far the simplest, most affordable, and easiest-to-use solutions. Their limitations are coverage (particularly inside an RV or boat), speed, and data plan limits. When outfitting our new Nordic Tug “Airship” – we wanted something that would be flexible, trouble-free, fast, and reliable. We wanted something that would give us far greater range of coverage than we could get with consumer-grade devices. Since this is our business, we wanted a business-class solution. That’s what led us to Moovbox. We bought ours from SinglePoint Communications (the same company we bought our WiFi-in-Motion setup from several years ago). So far, we have been extremely pleased. Moovbox is a commercial-grade mobile router. It is designed for applications like providing public WiFi on mass-transit – busses, trains, etc. It uses cellular data modems – similar to the one inside your smartphone – to connect to the internet. It then creates a private, secure Wi-Fi network for you using that connection. Picture an industrial-strength MiFi powerful enough to be used by a bus-load of people all at once. It is ruggedly built and is made to withstand the rigors of the road – vibration, temperature, etc. It is also scalable – the M340 model we got can handle up to four modems with two SIM cards each – for a total of eight SIM cards. Obviously we don’t need that many, but we did want at least two modems – one for Verizon and one for AT&T, so we’d have coverage wherever either of those networks reached. 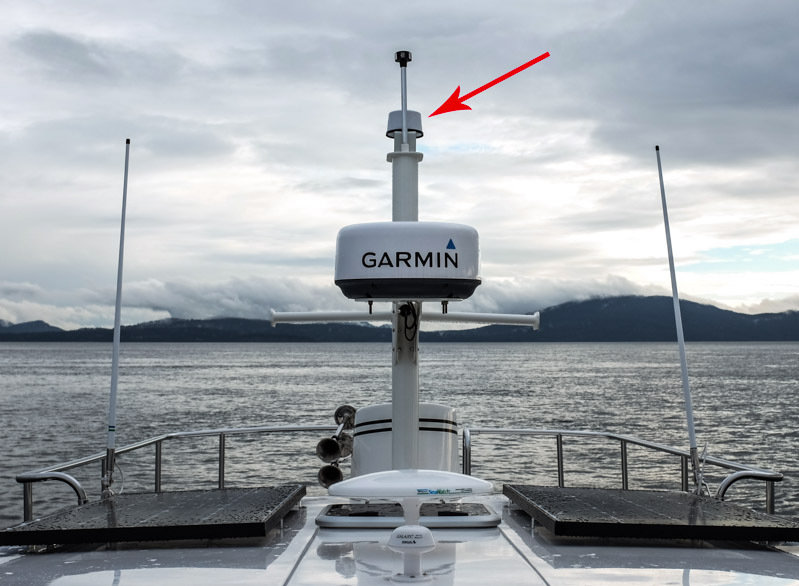 To get long-range reception, you need an external high-gain antenna. Check. Moovbox comes with a matched external antenna (with built-in GPS) that can handle two separate LTE/4G/3G modems. We had ours mounted on top of Airship’s electronics mast where it would have the best, unobstructed line-of-sight view to cell towers. 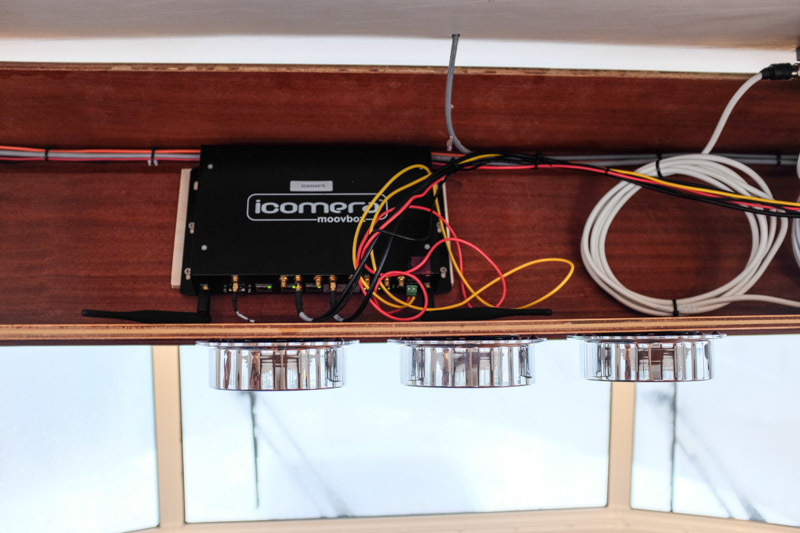 We mounted the Moovbox unit itself inside the electronics bay in the top of the pilothouse (behind the boaty instruments). Moovbox is made to be hidden away and forgotten. There are no controls on the outside, and it will be a rare day when you need to think about or look at the status LEDs on the front. There is a web-based interface used for initial configuration – setting up your WiFi network name, your password, and so forth. It’s all pretty simple and straightforward, and the technical and product support from SinglePoint Communications is top notch. Singlepoint installs the modems and SIM cards in the unit at the factory, and sends the whole thing out ready to install. You mount the antenna, hook up the antenna wires and 12V power, configure your network name, password, and preferences, and you’re done. When we go in and out of coverage for Verizon and AT&T, it magically and seamlessly maintains the connection with whichever is available. The range is FAR longer than we get with our phones or our old USB datacards on our laptops. So far, in the first month, we have been all over the farthest reaches of the San Juan Islands – to the booniest of the boonies like the rock-walled Active Bay on Patos Island in the uppity-tip-top corner of the US – almost surrounded by connection-cash-sucking Canada and miles from any US towns or infrastructure, and we had good, solid connections the whole time. SinglePoint also can provide a nice, one-source data plan they call “SinglePlan.” (See a theme here?) You can bring your own data plan as well, but we opted for theirs because it lets us get one, auto-pay bill that spans both our Verizon and AT&T SIM cards. The pricing is comparable to what we were getting with our previous plans directly from Verizon and AT&T. We haven’t gotten our first bill yet, so we’ll let you know how the rest of that process goes as we get more experience. Verizon has the best coverage by far – many places where there’s no AT&T. AT&T has coverage many places where Verizon does not. When Verizon and AT&T BOTH have coverage, AT&T is usually faster. Sprint has coverage almost nowhere except in cities where Verizon and AT&T also have great signal. 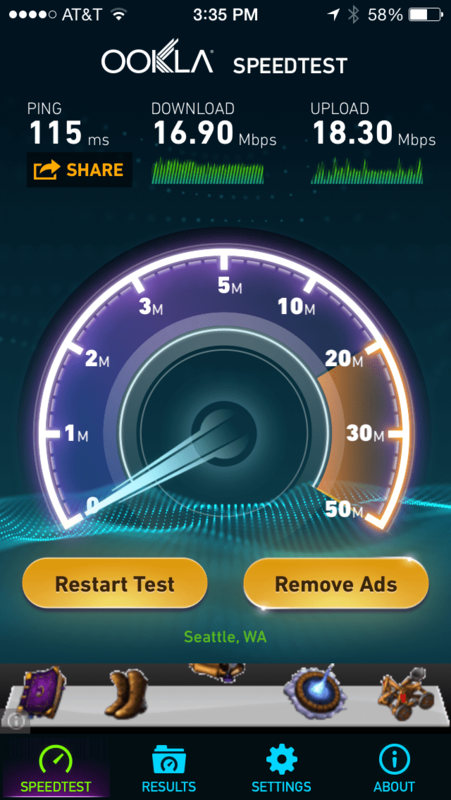 T-mobile is weak but still better than Sprint. That led us to the notion that to get the best possible coverage/speed combination possible, we wanted both Verizon and AT&T service. In the Airstream, making that happen is a nightmare gordian knot of antennas, cables, modems, boosters, router – all jumbled up together in the upper cabinet in the rear of the trailer. Each time we arrive at a destination, I’m juggling cables to find out which modem works where we are, checking signal strengths and connection speeds, and fiddling around until we finally get what seems like the best connection for the location. When we move, the whole process starts over again. It takes from five minutes to thirty minutes each time we settle down in a remote area for me to get an internet connection I’m happy with. With Moovbox, we just have internet. No fiddling or futzing or juggling cables. It’s fast, easy, stable, and omnipresent. The next step is to get Moovbox set up for Wi-Fi as WAN. That means when we’re at a marina (or in the case of the Airstream it would be an RV park), we’d like to use the Wi-Fi there (if available) as the internet connection for Moovbox. Then, all our devices can stay connected to our secure Moovbox Wi-Fi network, but we can use the marina/campground Wi-Fi as the internet connection from there so we don’t use up the data on our plan. We’ll report on that step once we have it working. Moovbox also has the capability to automatically switch to a Canada SIM card (if you have one installed with an activated plan) so that you can seamlessly travel to and from Canada without breaking the bank. So far, we don’t have a Canada data plan because we don’t spend enough time there to rate an entire dedicated account and monthly bill. But, it’s nice to know we could easily add that down the road. Well, if you consider it a business expense, it’s really pretty affordable. For the system, you’ll pay probably about what you’d pay for a decent laptop. That means it’s likely to be a four-digit number. The base-level system with only a single modem (we’d recommend Verizon in that case) costs only about half of the price of the super-expandable 4-modem, 8-SIM-card-capable unit that we bought. We like the idea of the future-proofing that it provides. If a new better technology comes out, they can just drop in a new modem. If we decide we want to start providing pay-Wi-Fi for the whole marina or campground wherever we go, it can support that as well. Given our experience so far, I’m pretty sure we’ll be getting one of these for the Airstream also.